PHOTO BY JACOB GURNEY Personnel work at the scene of an accident at CR 43 and East TR 8 Wednesday afternoon. 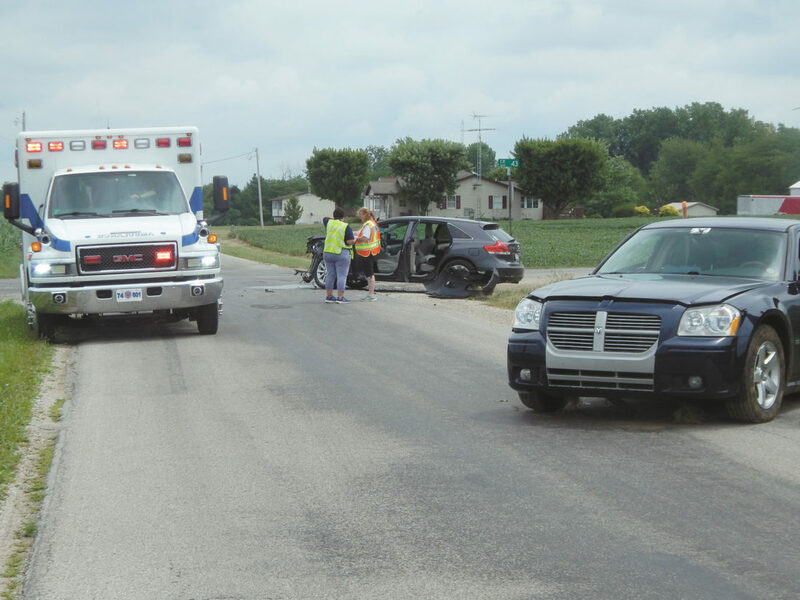 A man was injured in an accident at CR 43 and East TR 8 Wednesday afternoon. Deputy Denny Wilkinson of Seneca County Sheriff’s Office said Anthony Martinez, 41, of Tiffin, was traveling west on East TR 8 in a 2006 Magnum and Erika M. Shock, 16, of Bloomville, was traveling south in a 2010 Toyota Venza with Jay T. Shock, 15, of Bloomville. Shock stopped at the stop sign, pulled into the intersection and struck the Magnum, he said. Both vehicles came to a rest in the road, Wilkinson said. He said Martinez was transported by Republic EMS to Mercy Health – Tiffin Hospital to be treated for non-life-threatening injuries. Wilkinson said Shock will be cited with failure to yield at stop sign. Everybody involved was wearing their seatbelts, he said. The intersection was closed while crews worked at the scene. The accident was reported at 1:13 p.m. and Republic EMS, Scipio-Republic Fire Department, Seneca County Sheriff’s Office and John’s Welding and Towing responded to the scene.